30% OFF SEE OUR BACK PAGE AD FOR THE OFFERS! 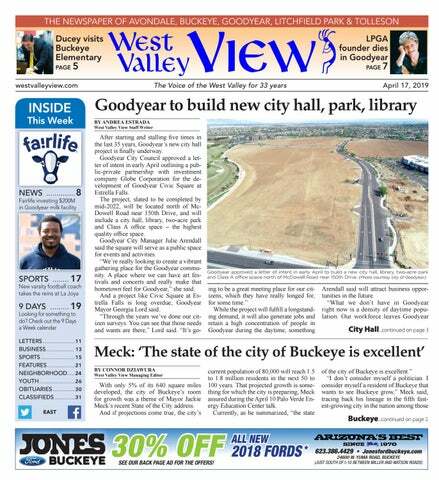 The West Valley View is a controlled-circulation weekly. It is published every Wednesday, and distributed free-of-charge to homes and in high-traffic locations throughout Avondale, Goodyear, Litchfield Park, Buckeye and Tolleson. Home delivery of the West Valley View is complimentary and offered to residents in the southwest region of the Valley of the Sun, saturating parts of Avondale, Buckeye, Goodyear, Litchfield Park, Tolleson & Waddell. The West Valley View can also be found free-of-charge at nearly 600 local business in the area. Requested mail subscriptions within Maricopa County: $75 annually or $40 for six months. Out of Maricopa County: $88 annually or $45 for six months. (c) 2019 Strickbine Publishing Inc. All rights reserved. West Valley View is distributed by AZ Integrated Media, a circulation service company owned by Times Media Group. The public is permitted one copy per reader. For further information regarding the circulation of this publication or others in the Times Media Group family of publications, and for subscription information, please contact AZ Integrated Media at circ@azintegratedmedia.com or 480-898-5641. 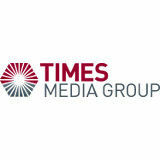 For circulation services please contact Aaron Kolodny at aaron@azintegatedmedia.com. A man was shot dead April 12 after he allegedly threw a wrench at a pair of Maricopa County Sheriff’s Office deputies and subsequently approached them with a hammer. According to MCSO, the incident occurred near 209th Avenue and Narramore Road, in Buckeye’s Rainbow Valley community just before midnight. The suspect, 39-year-old Juan Torres, was in the backyard, where the deputies made contact following a reported domestic dispute. Torres then allegedly threw a large wrench, striking one of the deputies, before approaching the pair with a hammer. The deputies fired their weapons, striking Torres. Torres was pronounced deceased at the hospital. One of the deputies sustained minor injuries. The investigation is ongoing, MCSO said. being designed for Historic Downtown Buckeye, and it will leave room for growth. Sundance Park is also in the works for expansion, and thanks to resident input the city will build desired amenities as funding is secured, he said. But Buckeye’s largest CIP, he said, is the $94 million Broadway Road Water Campus. Work started earlier this year on a new water transmission line along Apache Road. And when the first phase is complete by 2020, it will produce better water quality, he added. It will expand as demand requires, and be fully operational by 2022. “We have our work cut out for us in the coming years. We’ve also done a tremendous job getting Buckeye to where we are today – on the road to a successful future,” he said. “I am confident this City Council and the Buckeye city management have the passion, dedication and commitment to continue moving us in the right direction – building and improving our city services, while preserving our heritage in the process.” “The Buckeye in my day was great. The Buckeye now is fantastic. The Buckeye of tomorrow is destined to be incredible. And as always, Buckeye is open for business,” he concluded. The city of Buckeye’s fast-paced growth was a topic of discussion when Mayor Jackie Meck, community leaders and Arizona Public Service (APS) employees gathered at the APS Buckeye Service Center on April 8 for a celebration in honor of the city’s longstanding partnership with APS. According to Jacob Tetlow, APS’ vice president of transmission and distribution operations, Buckeye is the fastest-growing city in Maricopa County – which is the fastest growing county in the United States – and ranks fifth nationally (for cities with populations of 50,000 or more residents). “We’re moving things in the right direction, and we have lots to be proud of,” Tetlow said. But to continue that growth, which Tetlow described as “impressive stats,” Buckeye and Maricopa County need an electrical backbone. “They need a system that we will build to make sure that we promote that economic growth. It needs to be clean, it needs to be affordable, and it needs to be reliable,” Tetlow explained. PA Lambert graduated from Christian Brothers University with a bachelor’s degree in Natural Science. She obtained her master degree in Physician Assistant Studies from Christian Brothers as well. She is board certified and is a member of the American Academy of Physician Assistants and the Association of Physician Assistants in Obstetrics and Gynecology. Her interests include adolescent gynecology and general obstetrics. BE DEBT FREE IN 24–48 MONTHS! Do you owe more than $10,000 in credit card bills, medical bills or other unsecured debt? Let National Debt Relief help resolve your debt for a fraction of what you owe. West Valley Women’s Care provides compassionate, comprehensive advanced Obstetric & Gynecologic care to patients in the West Valley and Phoenix metropolitan area. We work with you to set up a single, affordable monthly payment. No Upfront Fees You won’t pay a penny until your debt is resolved. Resolve Your Debt in 24–48 Months We’ll resolve your debt as quickly as possible so you can finally start living the life you want. currently has a severe shortage of type O blood donations and urges type O donors to give now. eligible to donate blood. High school students and other donors 18 years of age and younger also have to meet certain height and weight requirements. Make an appointment to help save lives now by downloading the free Red Cross Blood Donor App, visiting redcrossblood.org or calling 1-800-RED CROSS (1-800-733-2767). Blood and platelet donors can save time at their next donation by using RapidPass to complete their pre-donation reading and health history questionnaire online, on the day of their donation, before arriving at the blood drive. To get started, follow the instructions at redcrossblood.org/rapidpass or use the Blood Donor App. earn direct monetary grants. Applications are due by 5 p.m. Thursday, May 9. The city has set forth a number of criteria. not exceed $10,000. Applications are available at https:// bit.ly/2VDS759. For more information, contact Sheryl Steele at 623-333-2717 or ssteele@ avondaleaz.gov. For questions or assistance with the online application, contact Paula Swenson at 623-333-2720 or pswenson@avondaleaz.gov. This is more than great rates This is more savings for wherever you’re going. Talk to a banker for details. Offer expires May 31, 2019. Business owner? Ask about our business savings rates. Smith began playing golf when she was 11. She won the Kansas State Amateur three consecutive times and was called “The Blonde Bomber” because she blasted the ball 25 yards longer than any other female player at that time. Although a fierce competitor on the course, she was a stronger advocate for equal treatment for women, which most say is how she will be remembered. “(Smith) has always been a giver,” Spork said. “She worked so diligently as president of the LPGA, out selling the tour to sponsors. When we traveled, we drove, and we’d pull into a gas station and she would start chatting up a young person. There she ended up giving away more money that we paid for our own gas.” Smith received the first Patty Berg Award for distinguished service to women’s golf in 1979. She was inducted into the World Golf Hall of Fame in 2006. Over the past few years, she continued to sponsor a tournament to raise scholarship money for female high school seniors planning to play golf in college. She continued playing golf recreationally until she was about 70, when she hurt her knee and was forced from the course. aid services. These services, which State President of Care1st Health Plan of Arizona Scott Cummings described as “needs that are inherent in any community,” are made available through 61 agencies that partner with the center. And Cummings said the center benefits the community and its partners equally. “Avondale residents were having to Care1st Arizona President Scott Cummings, left, and Avondale Kenneth Weise celebrated the 10-year anniversary of the travel into Phoenix, Mayor Care1st Resource Center on April 10. (West Valley View photo by in some cases, to get Pablo Robles) access to these services, and these human service agen- the center in its own unique way. cies really didn’t have enough business “I think it’s cool that a state agency, to warrant them, put staff out here and local city government and a health plan rent space of their own,” Cummings can come together and work together said. and share ideas and our resources, and “We see it (the center) as a hub of create a place where other partners health and human service agencies can come in and provide something,” that benefits them. It keeps their costs Bourne said. lower. They can spread their services “I don’t think we could’ve imagined wider, and it allows for the service to or even planned out the work that hapbe delivered in the community versus pens at this family resource center,” having people travel for those ser- she said. vices,” he explained. Cummings said the same partnerAnnette Bourne, regional director of ships will remain with Care1st Health the FTF Southwest Maricopa Region, Plan Arizona at its new facility – slated said each of the agencies contributes to to be under construction in 2020.
izona dairy farmers, is excellent news for our state,” Watson said. “Fairlife’s decision to expand to Goodyear is emblematic of the collaborative spirit of the region and highlights the determination local partners have to support business expansion,” added Chris Camacho, president and CEO of the Greater Phoenix Economic Council. “We look forward to the opening of its advanced manufacturing plant.” Reflecting on the origins of the company she co-founded, dairy farmer Sue McCloskey called the results of all the hard work rewarding. “We look forward to working with all our amazing partners and are committed to supporting the economic growth in the southwest region,” McCloskey said. In celebration of Cinco de Mayo, the city of Avondale is gearing up for a free street festival that will showcase culture, cuisine and entertainment. Avondale Fiesta is from 6 to 10 a.m. Saturday, May 4, on Western Avenue in Historic Avondale, 495 E. Western Avenue. As a part of the festivities, the event will feature dancing by Ballet Folklorico Esperanza at 6 p.m. and mariachi music from Mariachi Juvenil de Mi Tierra at 7:15 p.m. Headline act Chica Dust will perform cumbia fusion music at 8:30 p.m. Local vendors will also sell Mexican food, and there will be a beer garden for guests ages 21 and older. New to the event this year is a hot pepper eating contest. Prizes will be awarded to anyone who thinks they can surpass the hot pepper challenge. Limited spaces are available. Pre-registration and further details will be available from the events webpage at a later date. Avondale Fiesta is an official city of Avondale event, produced by Goosebump Marketing and Events. Business partners supporting the event are the Salt River Project, Crescent Crown Distributing, the West Valley View, Avenidas Funeral Chapel, Desert Diamond West Valley Casino, T-Mobile, PetSmart Charities and Alamar. For more information, contact Avondale Recreation at 623-333-2400; avondaleaz.gov/events. routes are Estrella Mountain Community College, La Joya Community and Westview high schools, Avondale Civic Center and Library, Historic Avondale, Gateway Pavilions, Wal-Mart, the Park 10 shopping center, Tolleson City Hall, and into Goodyear at the YMCA, West Valley Hospital and Target. Ridership for 2018 was just over 190,000 and continues to grow in popularity. Funding for the route is provided by local and federal transportation funds. Route operations are provided by the Regional Public Transportation Authority. For more information about Zoom or a map showing routes, go to avondaleaz.gov/zoom. All Valley Metro transit information is available at valleymetro.org or by calling 602-2535000; TTY 602-251-2039. At Faith, Ledyard & Faith, PLC, our lawyers and staff work hard to deliver quality solutions through superior service to our clients. Our mission is to serve the needs of our clients at a reasonable price and to maintain a lasting relationship. the Navy Richard V. Spencer said. “Readiness, lethality and modernNavy Office of Community Outreach ization are the requirements driving An Avondale native and 2011 Milthese priorities.” lennium High School graduate is servThe Pacific is home to more than ing in the U.S. Navy aboard the aircraft 50% of the world’s population, many carrier U.S.S. Theodore Roosevelt. of the world’s largest and smallest Petty Officer 3rd Class Timothy economies, several of the world’s Howar is an aviation maintenance largest militaries, and many U.S. aladministrationman aboard the carrilies. The Navy has been pivotal in er operating out of San Diego. As a helping maintain peace and stability Navy aviation maintenance adminisin the Pacific region for decades. trationman, Howar is responsible for Though there are many ways for maintaining records for the aeronausailors to earn distinction in their tical equipment and tracking that the command, community and career, maintenance for each piece of equipHowar is most proud of earning a Petty Officer 3rd Class Timothy Howar is a 2011 High School graduate. (Photo courtesy ment is accomplished. meritorious advancement for his Millennium Mass Communication Specialist 3rd Class Jason Meyer) Howar credits success in the Navy to achievements in “A” school. many of the lessons learned growing “Stepping into a new career field, es- carrier running smoothly – this inup in Avondale. pecially one as complex as maintaining cludes everything from washing dishes “The day I turned 16, I was out lookrecords for aeronautical equipment, I and preparing meals to handling weaping for a job,” Howar said. “That work had no idea what I was getting into,” onry and maintaining the nuclear reacethic was instilled in me from a young Howar said. “It took all of my drive tors. Another 2,500 men and women age.” and hard work to accomplish that ad- form the air wing responsible for flying Named in honor of former Presivancement.” and maintaining the aircraft aboard the dent Theodore Roosevelt, the carriSailors’ jobs are highly varied aboard ship. er is longer than three football fields, the carrier. Approximately 3,200 men “Naval aviation is the ultimate team measuring nearly 1,100 feet. The ship, and women make up the ship’s crew, sport, and a nuclear-powered aircraft a true floating city, weighs more than which keeps all parts of the aircraft carrier cannot accomplish her mission without the professionalism and expertise of every sailor aboard,” said Capt. Carlos Sardiello, Theodore Roosevelt commanding officer. “The crew of Theodore Roosevelt has proven themselves time and time again, and their level of professionalism and dedication is second to none.” Theodore Roosevelt, like each of the Navy’s aircraft carriers, is designed for a 50-year service life. When the air wing is embarked, the ship carries more than 70 attack jets, helicopters and other aircraft, all of which take Raymond D. James M. Johnson, M.D. off from and land aboard the carrier Suarez, M.D. at sea. All of this makes the Theodore Roosevelt a self-contained mobile airport and strike platform, and often the first Gema Fernandez, M.D. Cari L. Cowling, M.D. response to a global crisis because of a carrier’s ability to operate freely in international waters anywhere on the pting e c c A world’s oceans. Erica McLaughlin, M.D. Briggs J. Geier, D.O. ts n e i t a As a member of one of the U.S. NaP New vy’s most relied upon assets, Howar and other Theodore Roosevelt sailors Zamyra C. Lambert, PA-C know they are part of a legacy that will West Valley Women’s Care provides compassionate, comprehensive advanced Obstetric & last beyond their lifetimes providing the Navy the nation needs. Gynecologic care to patients in the West Valley and Phoenix metropolitan area. “You get the opportunity to experience things through the Navy that you 9305 W. Thomas Rd., Suite 155 just don’t get anywhere else, and it rewww.westvalleywomenscare.com ally does make you a better person,” Howar added. how the American people rise in times of distress to help each other. Now, what have our president’s sanctions done for us? It has compounded the catastrophes. He must not have realized what the results to Americans would be? Or was he just trying to satisfy his never-ending ego and throw his newfound weight around. I think Bush summed it up in one word – blowhard. To top it off, he likes Kim Jong-un, a ruthless dictator who has no qualms about killing anyone he feels doesn’t like him. No wonder Trump likes Kim Jong-un. What’s that old saying? “Birds of a feather flock together.” Some people can handle power, and some just can’t. The good news for Trump is that all the things he has put in motion while in office will take time to take effect. This will probably not happen until the next president is in office. CORRECTIONS In the April 10 story “Wildflower School wins Founder’s Award, $60K,” Dr. Araceli Montoya should have been identified as the school’s principal. In the April 10 story “ADHS: Buckeye Valley is ‘premier’ EMS agency,” the chief’s quotes should have been attributed to Mike Duran. In the April 10 Business Briefcase column, it should have said Roadrunner Harley-Davidson will employ upward of 30 fulltime positions. Additionally, Snap Fitness in Buckeye is at 827 E. Monroe Avenue. offer to pay for lunch. way “tip creep” seems to be impacting Sometimes, BTG loudly insists that more areas of society. it’s his turn to buy. Him winNowadays, there’s a tip ning that argument means I jar on every counter: the have to lag behind as we bakery, the ice cream shop, leave the restaurant, usualthe pet groomer, the car ly by lying about needing wash. to use the restroom. Then I That often leads to cushave to double back to our tomers standing registable and add enough cash ter-side, 53 cents in hand, to his buck to get us to a 20 waiting for the barista to percent tip, minimum. return for the ceremonial Why go to all that troudropping of the coins. ble? Partially it’s my fear of Because if a tip falls in a bad karma. But mostly it’s Starbucks and no employDavid Leibowitz. (Photo the years I spent waiting courtesy Advisor Group) ee sees it or hears it jingle, tables for more Bad Tipper was it really a tip at all? Guys and Gals than I care to remember. Then there’s the newfound popularI earned $2.13 an hour in those days ity of Square, the app that allows anyand was obligated to “tip out” a percent- one with a dongle and an iPad to take age of each check to the host staff and credit cards. busboys. If a diner stiffed me or left beEach Square transaction comes with hind a buck, that meant I actually paid for a gratuity opportunity and suggested the privilege of waiting on their table. amounts – no tip, 15%, 20%, 25% – A quarter century later, I still go out helpfully pre-calculated. of my way to tip well, even though I Talk about a chance to feel like a strongly dislike the concept – and the grinch. We Fix It Fast! We Fix It Right! No Interest Financing Options For All Credit Types. Now I find myself tipping people for labor-intensive acts like handing over an empty self-serve coffee cup or stuffing a wienie in a hot dog bun. The latest weird tip request? As of January 1, cheapo airline Frontier has started encouraging tips for flight attendants who sell travelers a pre-packaged sandwich or a can of soda. What’s next? Maybe a dental hygienist with a tip jar next to the tool tray. Or it’ll become customary to start slipping the minister a folded twenty after a particularly moving eulogy. Or, better yet, maybe we will move away from the gratuity model and instead pay people what they’re worth – even if that means a price hike. I’d rather hear Bad Tipper Guy complain about paying an extra two bucks for his stromboli than listen to him whine one more time about how tipping encourages indentured servitude in 21st century America. David Leibowitz has called the Valley home since 1995. Contact david@ leibowitzsolo.com. need us or they couldn’t get power. It doesn’t take much idiocy and ignorance to keep humanity on the road to demise. Look what idiocy and ignorance have done for humanity throughout history. Like the saying goes, “It only takes one bad apple to spoil the whole barrel.” I believe there are more good apples than bad on this earth. The good apples just have to not listen to the bad apples. Listening to bad apples is how idiocy and ignorance spread and win, and continue to win. Good old lynch mob mentality is still going strong. Idiocy will be the destroyer of mankind, unless we as individuals move to change it. Dennis Wood Goodyear How to get a letter published 250 N. Litchfield Road, Ste. 130, Goodyear, AZ 85340 E-mail: editor@westvalleyview.com The West Valley View welcomes letters that express readers’opinion on current topics. Letters must include the writer’s full name, address (including city) and telephone number. The West Valley View will print the writer’s name and city of residence only. Letters without the requisite identifying information will not be published. Letters are published in the order received, and they are subject to editing. The West Valley View will not publish consumer complaints, form letters, clippings from other publications or poetry. Letters’ authors, not the View, are responsible for the “facts” presented in letters. scription or being forgetful. Here are some helpful tips for you: Prep your pills: Find a pill box that suits your needs and get organized. Pill boxes are a great way to group your medications together by time of day and ensure you don’t forget a single dosage. They’re also easy to transport in a purse or bag when you’re on the go (just don’t leave them overexposed to extreme heat or sunlight). Set up reminders: Whether it’s an alarm on your mobile phone or free tools like Walgreens Pill Reminder via the Walgreens app, it’s easy to remember when to take your medications with a pre-programmed cue. Research shows that patients using pill reminders were more likely to take their medications correctly. Simplify refills: If you have multiple prescriptions, make the refill process easier by switching to a 90-day supply or setting up automatic refills. We’re also expanding a complimentary program called Save a Trip Refills, which coordinates your prescription refill schedule to a single pick up date, working with your doctors and insurance providers. That means you can save time and money on trips to the pharmacy. Educate yourself and ask questions: Knowledge is power, and pharmacists are a fantastic resource when it comes to better understanding your medications including side effects and drug-to-drug or drug-tofood interactions. If you have a question or concern, don’t be afraid to speak up and talk to your pharmacist. At Walgreens, you can talk to us at no cost in store or via the app’s Pharmacy Chat service, 24/7. Consider prescription delivery: If you find yourself unable to make a trip to the pharmacy, you can order your refills to come directly to you. For example, Walgreens Express gives patients the option of prepaying and picking up prescriptions in a dedicated line or getting their Jama is a local Walgreens pharmacist. (Photo eligible medications delivered Muna courtesy Walgreens) to their homes. One of the most rewarding better quality of life. things about being a pharmacist is carMuna Jama is a local Walgreens ing for patients and their families. That pharmacist. For more information on doesn’t just mean giving out prescribed Walgreens pharmacy services talk to medicines, but also helping our cus- any Walgreens pharmacist or find out tomers to take them correctly, which more online at walgreens.com/pharcan help them enjoy a healthier and macy. The Southwest Valley Chamber of Commerce has partnered with the cities it represents – Avondale, Goodyear, Litchfield Park and Tolleson – to hold a unique event for small- and mid-size business owners. The Southwest Valley Small Business Summit will provide an opportunity for business owners, managers and other professionals to learn, engage and grow from 7:30 a.m. to noon Thursday, May 16, at Adelante Health Center Goodyear. The half-day program gives business owners the tools, strategies and best practices they need to stay competitive in today’s rapidly changing business environment. for broadminded businesses and entrepreneurs. fice will retail RV supplies, equipment, moving supplies, ice and more. As for the expansion, it includes more than 200 covered and 30 uncovered RV spaces; more than 350 climate-controlled and 30 drive-up units; and features such as 24-hour RV and boat access, two RV/car washes with dump station availability, RV supplies, propane and dump, and trickle charger stations. As for the open house event, there will be appetizers, raffle prices, activities and more. Budget Mini Storage is at 3970 S. Estrella Parkway, Goodyear. For more information, visit storage-experts.net/ self-storage/az/goodyear/ budget-mini-storage-7. Speaking of the chamber, Alamar, a 1,130-acre master-planned community north of the Sierra Estrella Mountains at Avondale and boulevards, is expected to open in late 2020. Mayor Kenn Weise, pictured, speaks at the OrangeTheory Fitness’ Li- Broadway groundbreaking. (Photo courtesy Fingerpaint) tchfield location has joined as a member. In honor of its new info@southwestvalleychamber.org. lined sixth annual Goodyear Lakeside chamber membership, a ribbon-cutting Let’s continue. Trek Bicycle Store Music Fest, from 4 to 9:30 p.m. at the ceremony will be held at noon Friday, of West Phoenix business partners Estrella Lakeside Amphitheater. May 10. OrangeTheory Fitness is at Brian Abraham and Brandon van But Copper State itself expects to 14175 W. Indian School Road, Suite Leuven have another shop, Copper officially open for demos the followA07, Goodyear. For more information State Bike & Hike, on the way. De- ing day, Sunday, April 28, van Leuven on what the gym offers or to view its spite the differing name, it will still said. The extent of the location details studio schedule, visit litchfield.orange- have some Trek products, van Leu- available to the West Valley View at theoryfitness.com. ven noted, though it will mainly be this time are that it will be by the EsFor more information on Southwest a demo store showcasing available trella Star Tower. For more informaValley Chamber of Commerce-pro- biking technologies. Customers will tion on Abraham’s and van Leuven’s duced events, contact 623-932-2260 or be able to rent bikes for test riding on Trek store, visit trekwestphoenix.com trails and streets, essentially allowing or find it on Facebook @trekbicyclewthem to make a decision on whether estphoenix. or not they’d like to buy such a bike, Then, the Roadrunner Harley-Davan Leuven explained. However, cus- vidson, which I mentioned last week tomers will still have access to some should open near Pebble Creek Parkservices, as well as products that per- way and McDowell Road in fourth tain to hiking. The Goodyear store, quarter 2019, will staff upward of 30 however, is a showroom concept that fulltime employees. It is currently unMark Meinhardt focuses on sales and service, he add- der construction. For more informaed. Customers in need of tune-ups or tion, visit roadrunnerharley.com or find detailed services will still need to stop it on Facebook @roadrunnerhd. by that location, 13810 W. Test Drive. Also, the new Snap Fitness locaCopper State will be available to tion in Buckeye, which was aided by LIVING TRUST SPECIAL show offerings at the grand opening the city’s Catalyst Program, is at 827 ALL of Estrella by Newland’s new Lucero E. Monroe Avenue. It was formerly at INCLUSIVE village. That celebration is 11 a.m. to 410 E. U.S. Highway 85. For more inPACKAGE 3 p.m. Saturday, April 27. Casa Luce- formation, find it on Facebook @snapro, the new home information center, fitnessbuckeye. will offer limited-edition canvas bags That’s all the briefs for this week. and Lucero T-shirts while supplies last. Thanks for reading! Meinhardt Law Firm PLLC For more information or to RSVP, visit Have an item for Business Briefhttps://bit.ly/2UMU5Tz. That day also case? Email Connor Dziawura at cdzi145TH AVE. & WEST MCDOWELL, GOODYEAR coincides with the Smash Mouth-head- awura@timespublications.com. make the U.S. Youth Muay Thai team. Though just 12 years old, there is an opportunity for Gonzalez to already qualify for the team. If he wins the TBA Classic, he’ll be granted a roster spot, he said. All ages make up the youth team, “as long as they’re the best in the United States out of their age group,” Grado said. In addition to cracking the U.S. roster, Gonzalez will also earn a trip to Turkey, where he’ll train and compete there. “My favorite part about competing is to show how good I am,” Gonzalez said. Gonzalez just returned from a tournament in San Diego. He competed in Mexico prior to that, according to his mother. He currently trains with coach Jerry Laurita at the Sentosa Martial Arts gym in Avondale. From Monday through Friday, Gonzalez is in the gym polishing his craft, spanning several hours per night, his mother said. There were reservations from his mother about letting a young, 10-yearold boy join a sport as rigorous and physically-demanding as Muay Thai. “When I was pregnant with Eddie, doctors had to induce me because he was sick from his kidney,” Grado said. “He had a double ureter, the little tube that goes down to the bladder from the kidney. He had one that would come back up to the kidney and it was rotting the bottom half of his right kidney. Right now, he only has a kidney and a half.” His mother acknowledges that, yes, her son has taken a great deal of body shots – a la kicks and jabs – and certainly more are on their way. While she was initially nervous about the notion of him taking shots to his kidney area, she said Gonzalez has done an exceptional job of “protecting himself.” “We haven’t had any problems,” she said. Gonzalez is aware of the successes that have mounted before him since joining Muay Thai competition two years ago. Now, he’s got an eye on the bigger picture, which just so happens to be another big goal on his agenda. “I want to fight in the Olympics,” he said. That becomes a possibility at 15 years of age, he said. For now, as Gonzalez carefully eyes that Olympic appearance from afar, he’ll focus on sharpening his skills and traveling the world while doing so. All while just 12 years old. While in Thailand, Eddie will also make tennis shoes for less fortunate children in need of new Eddie Gonzalez is just 12 years old, but his Muay Thai skills shoes. have allowed him to travel the world and compete. (Photo For those interested courtesy Krystal Grado) in providing the family with the funds for this me.com/help-eddie-become-a-muaytrip, donations are accepted at gofund- thai-champion. 20 new species, including 3 new Rhinos! Don’t Miss our New Babies! Sunny the Sea Lion, Austin the Giraffe! and our newest Mountain Lion Cubs! Zoo, aquarium and safari park with 6,000 animals, 8 shows daily, tons of rides, a thousand thrills and a million smiles. All in One Day! Devin Dourisseau has been the defensive coordinator for the La Joya Community High School varsity football team for the last seven years. In his inaugural season in 2012, the Fighting Lobos finished 1-9. In 2018, they went 7-3, snubbed of their first playoff appearance since 2008. Dourisseau has seen a mixed bag of results in his time at La Joya: Four seasons below .500, one at 5-5 and two ending in winning records. The Fighting Lobos are committed to building off their 2018 program, and have made a corresponding move to prove it: Hiring Dourisseau as the program’s head coach in January. Former head coach Josh Mitchell, who had occupied the post since 2012 and hired Dourisseau as his defensive coordinator that fall, stepped down at the conclusion of last season. It was believed that Mitchell “felt he had run his course” as the school’s head coach, according to Dourisseau, but he did leave the position on good terms. Dourisseau, who is entering his rookie season as a high school head coach, is eager to up the ante of the Fighting Lobos program this fall. “I’m excited about our quarterback, Miguel Valdovinos. Last year, he threw for about 2,800 yards as a junior, seven touchdowns, and he was voted Offensive Player of the Year in our district. “Zachary Blackwood, too, who was a sophomore last year. He’s really matured, really showcased his talents,” Dourisseau said of Blackwood, who racked up a team-high 58 tackles in 10 games last year. “I’ve got some talent on both sides that I’m excited about.” Off the field, Dourisseau wants to incorporate the community more. In order to truly become a great football school, Dourisseau reasons, all parties have to be involved: Players, coaches and the surrounding community. “Because it’s La Joya Community High School,” he said, putting extra emphasis on community, “I’m trying to get the community involved. I have sent out letters inviting them to our meet and greet on April 27, where you come out and meet the coaching staff. I really want to invite the community out to be a part of what’s going on because you need that community support.” It’s Dourisseau’s program now, and he’s thrilled to put his own spin on it. quee matchups against Chaparral, Basha and Westview. Winning two of three of those games will almost certainly lock up a playoff berth, given La Joya is able to cross its Ts and dot its Is elsewhere on the schedule. “I’m the face of this organization that I’ve already been a part of, and I take that seriously. When your name is attached to something, you definitely want to make sure that you have your best foot forward and you take care of all the business,” he said. In an effort to get the community invested in what the Fighting Lobos are building, Dourisseau is putting on a Future Lobos Youth Football Camp on April 23 through April Head coach Devin Dourisseau has high hopes for his 26, aimed at getting children in- first season as head coach of the Fighting Lobos, including reaching the postseason for the first time volved in the sport. The community is also invited since 2008. (Photo courtesy Joseph Ortiz) to participate in the program’s information about the Lobo’s Booster meet and greet on April 27, where the Club and more. new coaching staff and administration For more information about both will be on full display explaining up- events, contact Dourisseau at devin. coming community service activities, dourisseau@tuhsd.org. WEST VALLEY VIEW NEWS | APRIL 17, 2019 vice on developing and pricing products and services at 6:30 p.m. at the Buckeye Coyote Branch Library, 21699 W. Yuma Road. For information, call 623-349-6354. The West Valley View publishes on Wednesday. The 9 Days a Week calendar — a listing of entertainment events such as concerts, theatrical performances, events for schools, churches, county parks and nonprofit groups — runs every issue. Events must be open to the public to be considered and generally must be held within the View’s coverage area, which is south of Northern Avenue, west of Loop 101, plus all of Tolleson, extending to Estrella in the south and Tonopah in the west. Events such as concerts and theatrical performances that fall outside the View’s circulation area will be considered because there are no concert halls or theater venues within our boundaries. 9 Days a Week calendar items print on a space-available basis. The only way to guarantee that an item will print is to purchase an advertisement. Submissions must reach our office by 4 p.m. Wednesday to be considered for the following Wednesday publication. Submissions must be in writing and may be emailed to Rachel Hagerman, rhagerman@timespublications.com or faxed to 623-935-2103. The Litchfield Park Museum has returned to its winter schedule: 10 a.m. to 4 p.m. Wednesday through Friday. Admission and parking are free. The museum is located at 13912 W. Camelback Road. For information, call 623-535-4414 or visit litchfieldparkhistoricalsociety.org. Children are encouraged to read a book each month before joining Lila for a book discussion and activities from 3:30 to 4:30 p.m. at the Tolleson Public Library, 9555 W. Van Buren Street. For information, call 623-936-2746. Sam Garcia Western Avenue Library hosts a weekly open-play group at 495 E. Western Avenue, Avondale, at 11 a.m. for children through age 5. For information, call 623-333-2601. The Church at Litchfield Park offers a free music program for children in kindergarten through fifth grade at 5:30 p.m. Wednesdays at 300 N. Old Litchfield Road. For information, call 623-935-3411. Learn Japanese words and cultural facts and watch manga and anime with friends from 5:30 to 6:30 p.m. at the Avondale Civic Center Library at 11350 W. Civic Center Drive. For information, call 623-333-2602.
to 9:30 a.m. Wednesdays at the Buckeye Community Center, 201 E. Centre Avenue. For information, call 623-349-6600. Bring children to the Tolleson Public Library at 9555 W. Van Buren Street, so they can hear picture books read aloud and play with other toddlers at 11 a.m. For information, call 623936-2746. Fitness in the Park is a free workout program that will cover basic strength and bodyweight training from 6:30 to 7:30 p.m. Thursdays at the Buckeye Sundance Park, 22865 W. Lower Buckeye Road. For information, call 623-349-6350. Join others in a game that lets people think creatively and solve problems in three dimensions from 3:30 to 4:30 p.m. at the Litchfield Park Library, 101 W. Wigwam Boulevard. Registration is required. For information, call 602-652-3000. Stop by the Avondale Civic Center Library at 11350 Civic Center Drive to pick up and read a copy of “The Radium Girls” by Kate Moore before the library’s discussion at noon. For information, call 623-333-2602.
blood drive from 9 a.m. to 2:30 p.m. at Walgreens, 1451 N. Dysart Road, Avondale. Walk-ins are welcome, but appointments are available. For information, call 1-800-733-2767. Visit a weekly Toastmasters Community meeting to become a stronger public speaker and leader from 6 to 7:15 p.m. in the Zane Grey Room at Avondale Civic Center Public Library, 11350 Civic Center Drive. For information, call 623-398-5550. The Bookmobile, a library on wheels, will be at 2000 S. Apache Road, Buckeye, from 1 to 2 p.m. Visitors can get library cards and check out and return books. For information, call 623-349-6300. Preschoolers and school-age children can visit Goodyear Branch Library with a parent to practice reading with a registered therapy dog. The Paws for Reading program starts at 2 p.m. at 14455 W. Van Buren Street. For information, call 602-652-3000. Fitness in the Park is a free workout program that will feature an interactive workout with lightly weighted drumsticks from 6:30 to 7:30 p.m. Fridays at the Buckeye Sundance Park, 22865 W. Lower Buckeye Road. For information, call 623-349-6350. Come down to the American Legion Post 53 at 402 E. Narramore Avenue, Buckeye, from 5 to 7 p.m. for Texas Hold ’Em. Games have a $15 buy in. For information, call 623-327-0227. Are you looking to improve your gardening skills? Master Gardeners will meet at the Litchfield Park Library, 101 W. Wigwam Boulevard, from 10:30 a.m. to noon to answer any gardening questions you may have. This month’s focus is irrigation. For information, call 602-652-3000. The Goodyear Branch Library at 14455 W. Van Buren Street invites parents to bring their children through age 5 to a fun play group at 10:15 a.m. that builds children’s motor and social skills. Toys can be checked out and brought home at the end of play group. For information, call 602-652-3000. Stop by St. Peter’s Episcopal Church at 400 S. Old Litchfield Road, Litchfield Park, for casual and formal apparel, jewelry, books, household items and home décor between 9 a.m. and noon. For information, call 623-935-3279. Hop over to the Goodyear Ballpark at 1933 S. Ballpark Way to meet the Easter Bunny and enjoy traditional and nontraditional Easter activities. There will be music, candy, games, egg drops, face painting, egg dyeing, a beer garden and more. The festivities will take place from 11 a.m. to 3 p.m. For information, call 623-882-7525. Get into a creative spirit by completing art projects from 10 to 11 a.m. at Buckeye Community Center, 201 E. Centre Avenue. This free program is open to all Buckeye Senior Program participants. For information, call 623-349-6600. Teen Leadership Club is a group that creates and carries out new programs for the Goodyear Branch Library. The team meets from 5 to 6:30 p.m. at the library, 14455 W. Van Buren Street. Registration is required. For information, call 602-652-3000. St. Peter’s Episcopal Church at 400 Old Litchfield Road, Litchfield Park, invites people desiring to deepen their meditation practice or try meditation for the first time to join them from 3 to 4 p.m. Sundays. All faiths are welcome. For information, call 623-935-3279. Wildlife World Zoo at 16501 W. Northern Avenue, Litchfield Park, will host an Easter egg hunt at 1:30 p.m. for children 7 years and under and at 3:30 p.m. for all children. The egg hunt is free with paid admission. For information, call 623-935-9453. The Tolleson Public Library at 9555 W. Van Buren Street invites babies and their caregivers to an interactive play time at 10 a.m. For information, call 623-936-2746. West Valley Human Services Alliance offers networking and features various speakers from 9 a.m. to noon every fourth Monday of the month at the Pendergast Learning Center at 3841 N. 91st Avenue, Phoenix. For information, call 623-935-3781. The White Tank Branch Library at 20304 W. White Tank Mountain Road, Waddell, will hold a yoga class from 3 to 3:45 p.m. for adults and teenagers. This class will combine stimulated laughter exercises and gentle breathing techniques to strengthen the immune system, reduce pain and lower stress. Registration is required. For information, call 602-652-3000.
tures, alignment and breathing on Mondays from 6:30 to 7:30 p.m. at the Buckeye Sundance Park, 22865 W. Lower Buckeye Road. For information, call 623-349-6350. Join friends to quilt for others from 9 a.m. to noon at The Christ Evangelical Lutheran Church, 918 S. Litchfield Road, Goodyear. For information, call 623-932-2394. The American Legion Post 61 hosts bingo Tuesdays at 6:45 p.m. These bingo nights have 17 games including Quickie, Early Bird, Double Action and a $1,000 progressive game. Come down to 35 N. Dysart Road, Avondale, to support the area’s youth and veterans. For information, call 623-932-4960. Buckeye Chamber hosts the Buckeye Business Connection from 7:15 to 8:30 a.m. every Tuesday at the Chamber office at 508 E. Monroe Avenue. This group serves coffee and a light breakfast and networks with business members in the community. Each week, there will also be a different guest speaker. For information, call 623-386-2727. Visit a Toastmasters Community meeting to become a stronger public speaker and leader from 6:30 to 7:45 a.m. at the Southwest Valley Chamber of Commerce, 289 N. Litchfield Road, Goodyear. For information, call 602-391-5781. Fitness in the Park is a free workout program that will feature pilates and yoga on Tuesdays from 6:30 to 7:30 p.m. at the Buckeye Sundance Park, 22865 W. Lower Buckeye Road. For information, call 623-349-6350. Game of Thrones fans are invited to solve riddles to escape the room and defend Castle Black in less than 60 minutes. Each session from 4 to 5:15 p.m. accommodates three to seven adult participants at the Litchfield Park Library, 101 W. Wigwam Boulevard. Registration is required. For information, call 602-652-3000.
sing songs and take part in activities at 11 a.m. For information, call 623-936-2746. Disciple Outreach Ministries, a nondenominational ministry, invites all to a Bible study at 7 p.m. Wednesdays at 10486 W. Emerald Lane, Avondale. For information, call 623772-0144. The Estrella Republican Club meets from 7 to 8:30 p.m. fourth Wednesdays of the month to listen to a guest speaker at Estrella Foothills High School, 13033 S. Estrella Parkway. For information, call 623-695-2435. Fitness in the Park is a free workout program that will feature a dynamic and aerobic Zumba dance on Wednesdays from 6:30 to 7:30 p.m. at the Buckeye Sundance Park, 22865 W. Lower Buckeye Road. For information, call 623-349-6350. Today’s story will be a recycling-themed tale with special guests from Republic Services from 10:15 to 11 a.m. at Coyote Branch Library, 21699 W. Yuma Road, Buckeye. For information, call 623-349-6300. Seek support and recovery from 6 to 7 p.m. at the Christ Evangelical Lutheran Church’s Fellowship Hall, 918 S. Litchfield Road, Goodyear. For information, call 623-932-2394. Goodyear Lions Club is a service group that provides free eye screenings, raises funds for veterans and their families, collects hearing aids and glasses and more. The Goodyear Lions meet at 6 p.m. fourth Thursdays of the month at Haymaker, 1800 N. Litchfield Road, Goodyear. For information, call 623-455-3253. Safely discard unwanted personal paperwork from 7 to 9 a.m. at Avondale City Hall, 11465 W. Civic Center Drive. A $1 charitable donation is requested for each box of personal documents you would like to shred at the event. Everyone is welcome to participate. For information, call 623-333-1000. Try your luck on this 5-level linked progressive featuring Extreme Multipliers, Free Games, jackpots and continually expanding reels. Collect Gold Buffalo symbols to expand reels up to 8,192 ways and Wild symbols that award 2x or 3x win multipliers! See Rewards Center for details. Must be 21 or older. Please play responsibly. An Enterprise of the Tohono Oâ&#x20AC;&#x2122;odham Nation. Limit one coupon per customer. Coupon not redeemable with any other offers. No cash value. Expires 12/31/19. Pasta Night Every Monday & Tuesday! EXPIRES 4/30/19. With coupon only. Present coupon at time of pruchase. May not be combined with any other offer. One coupon per person. Valid at all 8 locations. No cash value. Coupon cannot be reproduced. Lunch – Gyro Pita Special Daily 11am-4pm. With soft drink. NWC of 55th Dr. & Glendale 5516 W. Glendale Ave. - NO PHONE ORDERS M-Sat. 10am-10:30pm, Closed Sun. *Kids 12 and under. Valid at the Goodyear location. *Cannot be combined with other discounts or coupons. Tax, alcohol and gratuities are not included. *Cannot be combined other *Cannot be combined with otherwith discounts ordiscounts coupons. or coupons. Tax, alcohol and gratuities are not included. Tax, alcohol and gratuities are not included. Reproductions of or this coupon are not accepted. Expires 5/29/19. *Cannot be combined with other discounts coupons. are not included. Shown: Double Cheese Burger Value Basket *Cannot be combined with other discounts or coupons.Tax, alcohol and gratuities Tax, alcohol and gratuities are not included. Based on purchase at regular menu price. Please no substitutions. Not valid with any other offer. Value 1/200 cent. Limit one coupon per person per visit. Valid only at Culver’s of Avondale and Buckeye 450/570-4/18. have been with the group since its formation in 1996. One of those original members is Corky Lee, who said singing in the group became her outlet when she moved to Arizona in 1995. “I just had to sing. Singing is my passion. I did not want to move here, so that (joining) saved me,” she said. And Bob Mercer, 90, who is also a charter member, said one of the reasons he’s remained in the group for so long is because of the friendships he’s made. “The companionship has been wonderful. They always have a smile, and I smile back,” he said. “I’m very fortunate to have what I have.” That companionship is a result of the group’s constant interactions at rehearsals, PebbleCreek Singers President Jerry Drake said. *APY (Annual Percentage Yield). Rate current as of April 1, 2019. To qualify for the Money Market Plus higher dividend rate you must maintain (1) a daily balance of $50,000 or more to receive an APY of 1.75%, (2) At least one direct deposit (ACH automatic credit transaction) must post and settle to your account, (3) you must open a new checking account or have any existing checking with Credit Union West, and (4) If qualifications are not met, all balances earn 0.15% APY for the entire month. ** Compared to FDIC weekly national rate on April 1, 2019 on non-jumbo deposits (< $100,000) at 0.18% APY. Federally Insured by NCUA. Force Base and the Arizona Department of Corrections will run and carry the torch throughout the designated route. The Avondale event is part of the Law Enforcement Torch Run campaign to benefit the Special Olympics, which began in 1981 in Wichita, Kansas. The national effort of the Torch Run campaign is the largest grassroots fundraising movement for the Special Olympics. amphitheater. The Torch Run will start at noon. The celebration at the Civic Center will commence shortly after the torch arrives to the complex. The Avondale Civic Center Complex is at 11465 W. Civic Center Drive. For more information, to make a donation or to inquire about sponsorship opportunities, contact Sgt. Olivia Contreras at 623-333-7303. For more information about Special Olympics Arizona, go to specialolympicsarizona.org. just last month: “Dancing Across the Valley.” Buckley had spent time with the students and choreographed their dance for the event. McAlee said the performance went well and they’ve received great feedback. That collaboration between Ballet Arizona and EMCC’s dance department was the first of its kind between the two groups, and something both had been hoping to achieve. Now they plan to continue the collaboration on a yearly basis. Disney at the Goodyear Library Disney lovers gathered at Goodyear Branch Library on April 14 for an event themed after their favorite animated classics. The event featured crafts, trivia, karaoke, dancing, debates, videos and even cosplay. 1. Kamdyn Bucich, 6, Kardyn Bucich, 9 months, and Komrey Bucich, 9, wore “The Incredibles”themed clothing to Goodyear Branch Library’s Disney event; 2. Verrado High School senior Alexandria Smith and Connections Academy’s Gemina LaMeve, 13, don Disney attire as they welcome kids to Goodyear Branch Library; 3. Trivium Preparatory Academy’s Araya Rajab, 16, left, and University High School’s Anissa Aguilar, 17, had fun at the Disney event; 4. Madelyn Chavez, 11, sings karaoke songs from Disney movies; 5. Estrella Foothills’ Hailey Columbia, 15, right, paints the face of Verrado High School’s Brittany Sharp, 18; 6. Verrado High School senior Alexandria Smith holds hands with Mia Gunkel, 4; 7. Komrey Bucich, 9, sings karaoke songs from Disney movies. The idea of Go Figure is to arrive at the figures given at the bottom and right-hand columns of the diagram by following the arithmetic signs in the order they are given (that is, from left to right and top to bottom). Use only the numbers below the diagram to complete its blank squares and use each of the nine numbers only once. H Moderate HH Challenging HHH HOO BOY! Each numbered row contains two clues and two answers. The two answers differ from each other by only one letter, which has already been inserted. For example, if you exchange the A from MASTER for an I, you get MISTER. Do not change the order of the letters. SCRAMBLERS Unscramble the letters within each rectangle to form four ordinary words. Then rearrange the boxed letters to form the mystery word, which will complete the gag! living a healthy life. Truth is, feeling homesick is completely normal, but applying these techniques will prepare them with what they need to handle it, and will in turn give them a boost of self-esteem and independence. Remember that your camper is in great hands with our Girl Scout Camp staff and is available to work out any plans with campers and their families to prepare for it. Lastly, as you’re overcoming homesickness, remember to celebrate it! It is a great accomplishment for both parents and campers. For more information, acacamps. org/press-room/how-to-choose-camp/ homesickness. services, to see how they could work together to support students in the Estrella Foothills area. “West-MEC programs have a small registration fee, but it can be a hardship for some families. Seeing a need, they offered to donate the proceeds from their car show. But they don’t just donate money, they are student advocates,” Babyar said. Foothills High School who went to WestMEC. This year, there were 65 applications. It’s grown for a variety of reasons, but students are learning that some of the barriers are being removed,” said Maya Milhon, the lead recruiter at West-MEC. To learn more about West-MEC’s career training programs for high school and adult students, visit westmec.edu. the Conservatory of Theatre Arts at Webster University. The Conservatory at Webster is a professional training program for acting, musical theatre, directing, theatre studies and dramaturgy, design, technical theatre and stage management. Located in St. Louis, the Conservatory has been training theatre students for the professional world for over half a century. Students from the Conservatory of Theatre Arts at Webster University recently designed, constructed and performed “Photograph 51” by Anna Ziegler. The play centers on Rosalind Franklin, one of the great female scientists of the 20th century, and her fervid drive to map the contours of the DNA molecule. provide breakfast from 8 to 10 a.m., and lunch from 11 a.m. to 1 p.m. Monday through Friday. • Rancho Santa Fe Elementary School, 2150 Rancho Santa Fe Boulevard, Avondale, will provide dinner from 4 to 6 p.m. Monday through Friday. • Wigwam Creek Middle School, 4510 N. 127th Avenue, Litchfield Park, will provide breakfast from 8 to 10 a.m., and lunch from 11 a.m. to 1 p.m. Monday through Friday. In addition to farm fresh foods and no cost meals, fun activities will be available for children in an interactive setting. Daily activities vary and include celebrity food servers, carnival games, costume characters, reading and story time, water play days, arts and crafts, and the Nutrition Express Bus. Men tion ew Wes t Valley Vi e for an Exclusiv Of fer! The Avondale-Goodyear Education Foundation will award four $500 scholarships to graduating seniors who were promoted from eighth grade by one of the Avondale Elementary School District’s schools (Michael Anderson School, Eliseo C. Felix School, Lattie Coor School, Avondale Middle School, Wildflower School, Desert Star School, Desert Thunder School, Copper Trails School and STAR Academy). Eligibility requirements are: • Promoted from eighth grade from an Avondale Elementary School District school. • Been accepted to a university, college or junior college, or vocational, technical or health-related program. Applicants must submit: • Completed online scholarship application (avondalegoodyeareducationfoundation.com/scholarship) • One letter of reference from a teacher or administrator • Copy of college entrance (ACT or SAT) scores, if applicable • Official information on high school GPA (a minimum of 2.5 is required) • A copy of the admittance letter to the university, college, junior college, vocational, technical or health-related program • Latest transcripts Applications are due by Thursday, April 18. Incomplete or late packets will not be considered. To apply, visit avondalegoodyeareducationfoundation.org/scholarship. in the Buckeye Union High School District – Buckeye Union, Estrella or Youngker High School – and are attending a public Arizona college or university. Applications are due June 1. For more information or to obtain an application, contact DAR Scholarship Committee Chairwoman Gina Ragsdale at 623-256-3430 or 709 E. Eason Avenue, Buckeye, or e-mail darscholarbv@hotmail.com. Cormick explained. When the Goodyear high school’s entire 2,300-student population attends the now-annual career fair’s second iteration from 7:30 to 9:15 a.m. Thursday, April 25, each student will hear from three professions he or she selected. Students have been asked to sign up for three speakers in Google Forms, McCormick explained. Each session with each speaker will last 20 minutes, and then the students will rotate rooms. Last year it was the opposite – the speakers rotated. what the profession entails, and more. “We are having our kids ... write three questions for a presenter that they would like to have answered so that there’s never any downtime,” McCormick added. And with local restaurants even donating some food to the event, it’s in effect a “community effort,” McCormick said. To sign up, visit http://bit.ly/2Fuf8BJ. For more information, call 623932-7200, ext. 2027, or email Assistant Principal Rebecca Tibbetts at rtibbetts@aguafria.org. At Archway Trivium East, students engage in a conversation with their teachers and peers through the Socratic Method, and learn to think deeply about intellectual and moral virtue. From the very earliest years, students discover what it means to live in pursuit of truth, goodness, and beauty. Our classical, liberal arts curriculum is the foundation of this pursuit. Don Ray Bybee, 85, passed away peacefully on Sunday April 7, 2019 at his home in Buckeye. He was the husband of Maurine Bybee. They shared 65 years of marriage. Don was born March 22, 1934 in Firth, Idaho. He was the son of Lloyd and Bernice Bybee. He was a dairy farmer in Hamer, Idaho and Buckeye, Arizona. He was a member of the Church of Jesus Christ of Latter Day Saints, where he held many positions He enjoyed fishing, hunting and spending time with his family. He was funny, loving, quick witted, generous, understanding and always had a smile on his face. He will be greatly missed by family and friends. He is survived by his wife Maurine Bybee, his son Robert Bybee (wife Donna), his daughter Cindy Dickerson, 15 grandchildren and 33 great grandchildren. The funeral service will be held on Wednesday April 17, 2019, at 10:00 am at The Church of Jesus Christ of Latter Day Saints on 1002 East Eason Avenue, Buckeyeye. The visitation hour will be held from 9:00 am to the time of the funeral service. Funeral arrangements are being handled by Buckeye Funeral Home. Need help writing an obituary? We have articles that will help guide you through the process. Deadline for obituaries is Thursday at 5pm for Wednesday. All obituaries will be approved by our staff prior to being activated. Be aware there may be early deadlines around holidays. Kim C Schimmel Kim Cady (KC) Schimmel was born on July 2, 1948 to Ortwin and Jean Schimmel in Highland Park, IL. Even after KC suffered a back-breaking injury, he continued to work out, swim and even scuba dive becoming an inspiration to other para and quadriplegics. With a well-known love of the latest technological gadgets, KC will forever be remembered by his family and friends as a "boy who loved his toys". KC passed away peacefully on April 6, 2019. There will be no services. Crecencio R. Hernandez, 79, of Avondale, entered into eternal rest on March 6, 2019 in Goodyear. He was born on December 10, 1939 in Tempe to Crecencio and Margarita (Ruiz) Hernandez. Crecencio was united in marriage with Alicia Garcia Hernandez and he worked as a truck driver until his retirement. He is survived by his wife Alicia Hernandez; four children: Alex Hernandez(Belia), Thomas C. Hernande z ( J u l i a ) , L o r i P e t e r s ( S t e p h e n ) a n d M a r y Hernandez(Cody); eight grandchildren: Gabe Hernandez, Alex Hernandez, Joseph Rivas, Alyssa Patterson, Paul Michael Peters, Monica Hernandez, Anthony Hernandez, Javier T. Hernandez; seven great-grandchildren: Lexie Hernandez, Myly Hernandez, Jayden Hernandez, Aaden Hernandez, Izabella Hernandez, Serenity Rivas and Sofie Peters; three brothers: George Hernandez, Jimmy Hernandez and Ernesto Hernandez; three sisters: Rita Ramirez, Mercy Valdez and Elizabeth Ramirez; other relatives and many friends. Services were held Tuesday, March 12, 2019. Interment at Holy Cross Catholic Cemetery in Avondale. Arrangements entrusted to Holy Cross Catholic Funeral Home, Avondale. AIRES is looking for caring, capable and compassionate people! Our mission is to help people live happy, healthy & fulfilling lives. Hiring Caregivers for In Home Care dept (HCBS) & Group Homes in the West Valley **No Exp necessary! Paid training. Must be 21+yrs w/ good driving record & reliable transportation. Apply at www.aires.org or visit us at 2140 W. Greenway Rd, Ste 140, Phoenix. Must be 19 years of age to apply. 2293 N. PebbleCreek Pkwy., Suite 101 Goodyear. CONCRETE FINISHERS NEEDED IMMEDIATE OPENINGS for work throughout Maricopa County. Must have a valid driver's license, own transportation and be able to bend and lift. We are looking for highly motivated individuals that enjoy teamwork. On the job training, paid time off with a competitive rate. Please email resume to MDMerrett@aol.com or give us a call at (480) 575-0915. VALLEYLIFE is a non-profit organization that provides programs and services to men, women, and children with developmental disabilities. Full Time and Part Time Caregivers Needed! Must have reliable transportation We are currently looking for caregivers to work in group homes throughout Glendale, Phoenix, Peoria and Scottsdale. Must pass background check. LANDSCAPING SERVICES Jose's Landscape, General landscape clean up & Maintenance service, junk removal, free cactus removal please cal for free estimate, 602-615-6231 O.N.B. Specializes in landscaping and trimming. Also Concrete: patios, driveways, sidewalks, additions and more. Free estimates. 623-249-0610 - Robert Residential/Commercial. FIND IT! BUY IT! SELL IT! One Call Can Fix It All! ★ Emergency Service ★ ALL Makes & Models ★ FREE Quotes for New Units ★ Financing Available ★ Local Family Owned Business ★ Friendly Service Every Time! Honey Do List Too Long? Check out the Handyman Section! Water Heaters • Faucets • Toilets • Filtration & R.O. Drywall Painting/Texture • Electrical • Fans • Lighting Pool Repairs • Drain Cleaning • Sewer Cameras Bathroom Remodel/Update • Plus Much More! ESTABLISHED IN 2006 Providing service to people, not just machines. Your Custom Remodeling Specialist For All Your Home Improvement Needs! Best Prices! Fast, free pickup! Fully insured. We carry work insurance on all employees. We’re on A-CALL A-CALL aa cacallllreawawonayaylyly PAINTING We’Wree’ only a call away ! Family Owned & Operated Not afraid to work weekends Get out of the crowd and join the family! The most experienced and compassionate home care service in the West! Check us out on Angie’s List, Manta, Porch and Yelp Business Listings. Same Owners, Same Great Service! GLASS SERVICES Don’t let your broken panes... Break your bank!!! AS LOW AS $45 PER ISSUE ASK US HOW! * Irrigation system and repairs (Valves, drip, timers, & sprinklers) * Pavers * Artificial grass * Malibu lights * Maintenance, general clean-ups & hauling * House painting, interior & exterior AND MUCH MORE. CALL FOR FREE ESTIMATE. Our Goal is not to be the Biggest – Just the best! U.S.A.F. Retired. 25+ Yrs. Exp. We raise the roof with our quality, service and value! WINDOW COVERINGS We make SHUTTERS Affordable! Offering Vinyl & Wood Shutters and Blinds too! Don’t Let Your Roof Play A JOKE On YOU! Your Residential and Commercial Roofing Contractor Has You Covered! We’re Here To Answer Your Questions. Give Us A Call! STK# 18501 • Auto • Alumn Wheels • Rear Camera • Much More!! STK# 18348 • Auto • 1.0 L Eco Boost • Rear Camera • Much More!! STK# 18411 • 4WD • 1.0 L Eco Boost • Rear Camera • Much More!! STK# 18554 • 19” Prem Alumn Wheels • Sync 3/8” Touch Screen • SE Appear Pkg • Much More!! STK# 18388 • Class IV Trailer Tow • Pwr GRP • Sync • Much More!! STK# 18269 • Heated Leather Seats • Class III Tow Pkg • Pwr Liftgate • Much More!! STK# 18474 • XLT Tech Pkg • Pwr Lift Gate • Navigation • Much More!! STK# 18252 • Alumn Wheels • Rear Camera • Auto • Much More!! STK# 18479 • Ext Running Board • 6.7 L Diesel • Bliss • Much More!! 623.386.4429 | JONESFORDBUCKEYE.COM *Must Qualify and Finance through Ford Motor Credit Financing. All sales prices and offers cannot be combined with any other offers or promotions. Prices subject to change. All vehicles subject to prior sale. Prices do not include sales tax, license, $379.00 dealer doc fee and any dealer add-ons. Prices valid through 04/23/2019. Sales vehicles may have scratches, dents or dings. See dealer for details.